Steven Krivit is the editor of the New Energy Times. Krivit is an authority on Low Energy Nuclear Reactions (LENR), and has spent the past decade thoroughly and scientifically studying LENR phenomena. The entrepreneur Andrea Rossi has claimed to have invented a LENR device capable of producing far more energy than it takes in. In an interview with Sander Olson for Next Big Future, Krivit discusses the absence of scientific evidence to support Rossi’s claims, the questionable nature of the demonstrations that Rossi has given, and the reasons why he is a skeptic of Rossi. Question 1. You have been studying Low-Energy Nuclear Reactions (LENRs) for the past decade. Are you familiar with new-energy firms such as Blacklight power and Steorn? I put my time and attention into research where I can either have direct access to physically observe something, or have access to quality scientific reports. Question 2. Andrea Rossi served time in prison during the 1990s for tax fraud and other crimes. Are you familiar with his background? Yes, in doing background research on Rossi, I learned that he served time in prison for toxic waste pollution, fraud and tax evasion. He founded a company called Petroldragon in the 1970s which was supposed to create oil from waste but according to more than 100 newspaper accounts, he never created any oil but he allowed toxic waste to pollute the land and groundwater in the region. During a twelve-year period starting around 1992, he was tried 56 times in court and he was acquitted 51 times. The government eventually forced his company to close. Rossi then moved to the U.S. and founded the Leonardo Corp. In January 2011, Rossi publicly claimed to have successfully demonstrated an energy producing LENR device. Question 3. It would appear that the best way to evaluate the viability of Rossi’s E-Cat device would be by using a flow calorimetry system. 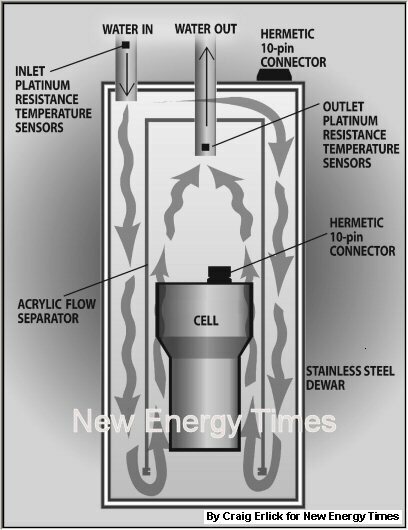 Why not just add more water to the e-cat device and test the heat production using this kind of system? You are correct, if you increase the flow of cooling water, it should have no impact on the operation of the device but it would allow the use of standard flow calorimetry which is far simpler than what Rossi has done and is much more accurate. Measuring the temperature rise in a flow calorimetry system should be simple if you have a sufficiently large effect, which is what Rossi claims to have. Question 4. Has Rossi provided an explanation as to why he won’t test using standard flow calorimetry? Rossi has never given a clear explanation as to why he won’t show a test using a water-only system measured by standard flow calorimetry. Rossi claims to have run tests on a water only system, but I’ve never seen any evidence for it. Levi said he ran such a test but he won’t release the data. When someone makes a scientific claim and they avoid doing a confirmatory test that is obvious and they instead respond with anger and questionable excuses, it is a very bad sign. Question 5. So Rossi uses steam, which is considerably harder to measure. Yes, Rossi claims to be feeding water in at a rate of 7 liters per hour. But you have to know that when steam is fully vaporized, it expands 1,600 times in volume. So that should have produced 11,200 liters of steam per hour, all coming out of a small black hose. The only minor uncertainty is how much of the steam would condense in the 3-meter hose. But at his claimed rate of power, it should be coming out at 60-110 miles per hour so there’s not much time for the steam to condense. Question 6. The video you took shows the steam coming out of the device rather slowly. The steam was coming out in little puffs, similar to what you see in an electric tea kettle. Engineers who have seen the video estimate that it was coming out at a rate of about 10 miles per hour. So if Rossi is pumping in 7 liters of water per hour, and he’s saying that its all being vaporized into steam, but we’re only seeing a fraction of that come out of the hose, the where is the rest of the water going? Question 7. So there are multiple issues regarding the steam being produced. There are three separate issues with the steam. The first is the small amount of steam being produced. We can see this with the naked eye. Why is there so little steam coming out? The second issue is that, because the device is not vaporizing most of the water into steam, where’s the rest of the water going? Many engineers figured this out and sent me their analyses. It’s going into the hole in the wall — or into the blue bucket. Why do you need a bucket to collect hot, dry steam? The third issue is the dryness of the steam. Remember that Rossi claimed that a) all of the water was vaporized, and b) all of the vaporized steam was perfectly dry, that is, it had no water droplets suspended in it. On what did Rossi base his claim of perfectly dry steam? He hired a consultant who used a humidity detector to measure the quality of the steam. Major problem: air is an entirely different set of elements than vaporized water. And a humidity detector is designed to measure air. You need a completely different type of device to measure steam dryness. Question 8. Do you know where Rossi’s laboratory is located? When I visited Rossi in June, 2011 in Italy, he said “welcome to my laboratory.” But this did not look like a laboratory to me – there were no lab benches, no glassware, no plastic ware, no tweezers, not even cabinets that might hold such things; nothing. It looked an empty industrial garage with an old wooden table or two and a few rented tables and chairs. The only tools I saw were a bag of plumber tools. This was neither a factory nor a laboratory. Question 9. Rossi’s Leonardo corporation is located in Florida. What do you know of that location? Corporate records indicate that the address of the Rossi location is in Miami, Florida. A Google map view indicates that the building is an apartment complex. Although I have not physically been to that apartment, it seems very unlikely to me that he and his wife have 300 E-cats in their apartment. Question 10. What do you know of e-cat delivery schedules? The first time Rossi claimed to have an e-cat device ready for market was on Jan. 16, 2011. He said then that he was not interested in scientific validations. Many times after that, he claimed that the first e-cat device would be ready by October, 2011. On Oct. 28, 2011, he claimed that the first e-cat customer had taken delivery of the device. On Jan. 19, 2012, his fans noticed that no delivery was made. Now he says it will be another 18 months before he makes the first delivery. Question 11. What do you know of Rossi’s offer to NASA and the University of Bologna to pay them to test an e-cat device? On July 14, 2011, Rossi verbally agreed to pay NASA $50,000 to test his device. On July 22, 2011, Rossi rescinded that offer, and instead, offered to allow NASA to test his device if they paid him $15 million. Of course, NASA told Rossi they were not going to pay him anything. On March 10, 2011, Rossi said that he was paying €500,000 to the University of Bologna to test and evaluate his device. Ten months later, he had paid nothing to the university and so on Jan. 15, 2012, they cancelled the contract. Question 12. What predictions do you have for the next several years regarding e-cat? Within the next month, New Energy Times will release a complete timeline of the Rossi endeavors. I urge readers to examine this timeline when it is published. It should prove very enlightening to anyone interested in this matter. I also encourage readers to learn the scientific facts about LENRs. There is a reason why Rossi picked up on it — it may lead to one of the most disruptive technologies we have seen in a long time.